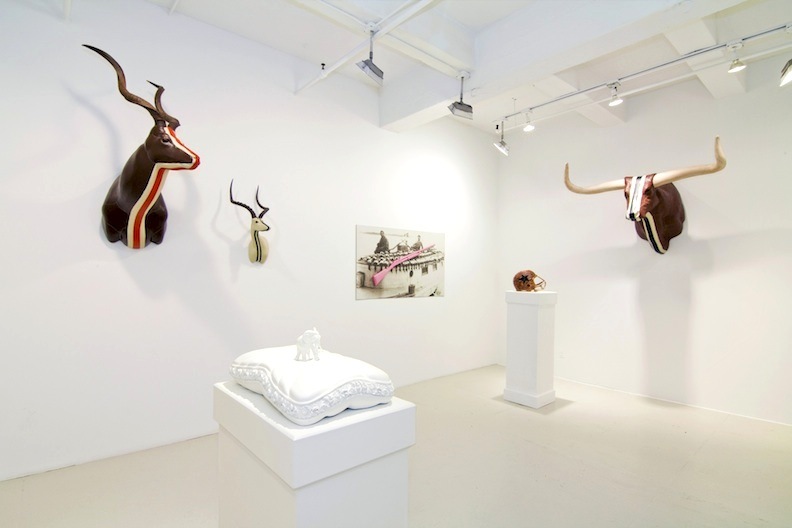 Salomon Contemporary is proud to begin its 2011/2012 season with Michael Combs: Be All You Can't Be, a solo exhibition of new sculpture that explores the human condition exemplified by man's competitive nature and need to seek validation through societal trophies. Growing up on Long Island's East End, Combs was raised by generations of hunters, fishermen, boat builders, and decoy makers. Instead of inspiring Combs to become an avid hunter himself, his upbringing ignited his passion for nature and position against the vanity of the sport. The artist's continuous use of historic "tools of the trade" is evident. With years of childhood experience in gutting and dissecting game for hunters, Combs understands their anatomy to perfection. While many artists favor a human subject, his muses are animals. The newest trophy mounts come complete with stylish racing stripes. The decoration appears to be merely fashionable. However, the true purpose of the stripe is to provide the driver with a swift reference to calibrate passing distance, allowing him to be the victor. The artist empathizes with the losing side and continues to press topics of bravado, insecurity, and personal rites of passage as his subjects. Combs uses familiar elements of Americana and materials reminiscent of masculine icons such as Hemingway and Roosevelt. His football helmets, punching bags, and sports equipment illustrate another boyhood obsession, and they are symbolic of how the west was won within the context of an infamous sports rivalry. The equipment acts as another example of the societal need for acceptance and a reminder that sometimes it's best to be all that you can't be. Michael Combs lives and works in New York. He has a MFA from the School of Visual Arts and has shown at galleries and museums throughout the US. 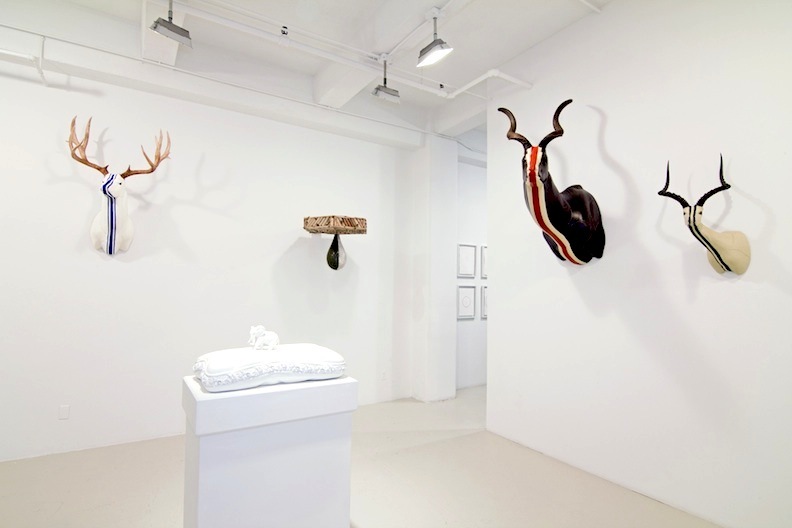 In 2005, Combs's solo exhibition The Trophy Room transformed the Parrish Art Museum gallery space into an immersive display of sculpted hunting conquests. In 2008, Salomon Contemporary, East Hampton presented The Lodge. This is Combs's second solo exhibition with the gallery. In 2012 he will have a fifteen-year survey at 21C Museum in Louisville, Kentucky.